These days if we want to get from one place to another we have a number of choices available to use. When driving in the car, I tend to use SatNav. I use SatNav even for familiar routes because it is fairly reliable at rerouting me when poor traffic conditions block the way ahead. Just this weekend I went on my weekly pilgrimage to see my children, and SatNav took me off the motorway to partially avoid a traffic hold up. Sometimes my SatNav throws a wobbly. There are a few points in my regular journey where I have come to learn (at my previous cost) that I should ignore the SatNav. These are normally because the road has changed since my SatNav was installed (and the map is not updated). Without the traffic updates, I probably wouldn’t bother with SatNav at all most of the time. I prefer to check out my route in advance using google maps, and use the map on my phone when I get close to the destination. Before electronic maps we had the familiar A-Z Atlas in the car. Everyone I knew had easy access to an A-Z of London. You had to update it every couple of years but in reality, we would get the tube to the closest point and follow directions from there. Even in the world of SatNav and perfect maps, we have to exercise caution. Even in the world of perfect maps, the maps don’t tell us everything. Maps don’t tell us which routes are safe or dangerous, whatever that danger might be. Trusting too much to a map is dangerous. In cities like London, with its twisty roads formed by generations of cows and sheep herders, it is easy to get lost and ending up pointing in completely the wrong direction. Even with a map, people in towns may find a compass useful sometimes. Before comprehensive maps, people used strip maps. 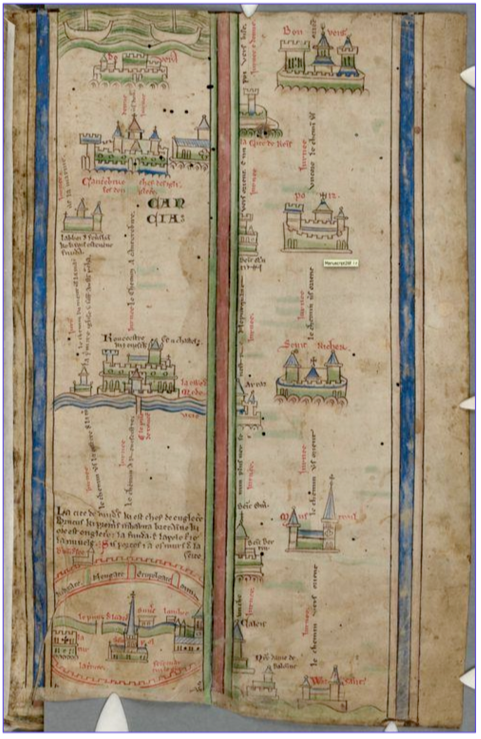 Particularly in Medieval times, these maps were used to help people travel along popular route such as pilgrimage trails. This is an example of a strip map. If you were going from London to Jerusalem, the strip map was pretty helpful. But what if you were starting out in Paris, or Stockholm, or Beijing? Then the strip map was of limited use. You may have another strip map that converged with a point on the Strip map to Jerusalem but you have no guarantee that its the safest or easiest journey from where you are starting out. Last week I discovered the strip map metaphor to be particularly useful to explain to people about Scaling Agile. Rather than tell them we have a SatNav that will get them to Jerusalem, I explained that we were on a journey that few if any had ever been on before. There were Strip Maps (experienced individuals and experience reports) that could help us with parts of our journey but we had to be aware that we may come across obstacles that others have not described yet. In Cynefin terms, it activated people to a heightened state of awareness so that they would challenge the route rather than simply follow it without thinking. For team level Agile we have SatNav supported in five dimensional cyberspace. For organisational level Agile, we have a few strip maps written on vellum. For Scaled Agile, we are still mapping out the territory. In fact, we are still determining the dimensions of the territory. Culture is one dimension, as is the Cynefin domain. Scale changes everything so that’s probably going to end up as a dimension as well. As will the business domain. As the saying goes, if you want to get to Jerusalem, I wouldn’t start here. There are some successful strip maps. If you want to get from Croydon, New Jersey to Jerusalem you can follow a Safe route. In Cynefin terms, if your company is in the over constrained “Obvious” domain, then Safe will help you migrate from DSDM or RUP to the true “there is only one way” “Obvious” SAFE route to the Jerusalem Hotel in Nevada just a few mines south of the place that features at the end of “Thelma and Louise”. The danger is if you happen to live in Meinehatten, Germany, following a SAFE route might lead to more danger than finding a local explorer with experience of a similar journey to Masada. Make sure the explorer has an extensive network of fellow explorers to reduce the risk. Strip maps are a great metaphor for the state of Scaling Agile. Strip maps encourage a “Safe Fail” OVER “Fail Safe” mentality. Before we move forward, lets make sure we can get back to safety. As a metaphor it helps organisations understand that they will need lots of strip maps. They will also need compasses, and sextants, and models and beliefs (theory), and they will also need climbing ropes for those experiments that are not “Safe to Fail” enough. My gratitude to Martin Burns for introducing me to strip map metaphor after I wrote about “Scaling Agile being off the map”. This entry was posted on Monday, June 29th, 2015 at 5:32 pm	and posted in Uncategorized. You can follow any responses to this entry through the RSS 2.0 feed. « Understanding Uncertainty’s impact on Learning. Thanks for this idea … I’ll start trying it out as a metaphor in my day to day.